This page is for the original version. For the Enhanced Edition, see Divinity: Original Sin - Enhanced Edition. Includes Divinity: Original Sin - Enhanced Edition. Kickstarter backers can choose between a Steam or GOG.com key (set in Larian Vault account settings). 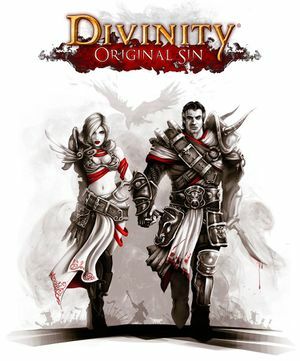 Buyers will receive Divinity: Original Sin - Enhanced Edition. Delete or rename the file Splash_Logo_Larian.bik. Game does not allow you to remove any key bindings. You can only assign a second key to the same task, so both keys are always active. FX, music, ambient, voice and video. Can be modded to support 4 (extras play as companion). 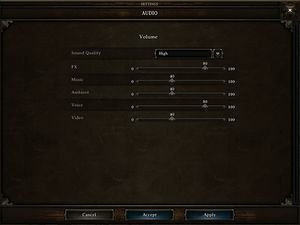 See Helix Mod: Divinity - Original Sin: 3D Vision Fix. This setting potentially uses more VRAM. Revert changes if crashes occur. Open %USERPROFILE%\Documents\Larian Studios\Divinity Original Sin\graphicsettings.lsx with Notepad. The game doesn't recognize the graphics card and only runs with an onboard chip. Might only work for Nvidia cards. ↑ 1.0 1.1 File/folder structure within this directory reflects the path(s) listed for Windows and/or Steam game data (use Wine regedit to access Windows registry paths). Games with Steam Cloud support may store data in ~/.steam/steam/userdata/<user-id>/230230/ in addition to or instead of this directory. The app ID (230230) may differ in some cases. Treat backslashes as forward slashes. See the glossary page for details. This page was last edited on 21 April 2019, at 12:36.